Obama, U.N Secretary-General, E.U. Condemn Syria : The Two-Way U.N. Secretary-General Ban Ki-Moon condemned Syria's use of violence against anti-government protesters, urging Damascus to halt its military attacks. In a statement, Ban said Syrian officials "are accountable under international human rights law" for violence against civilians. 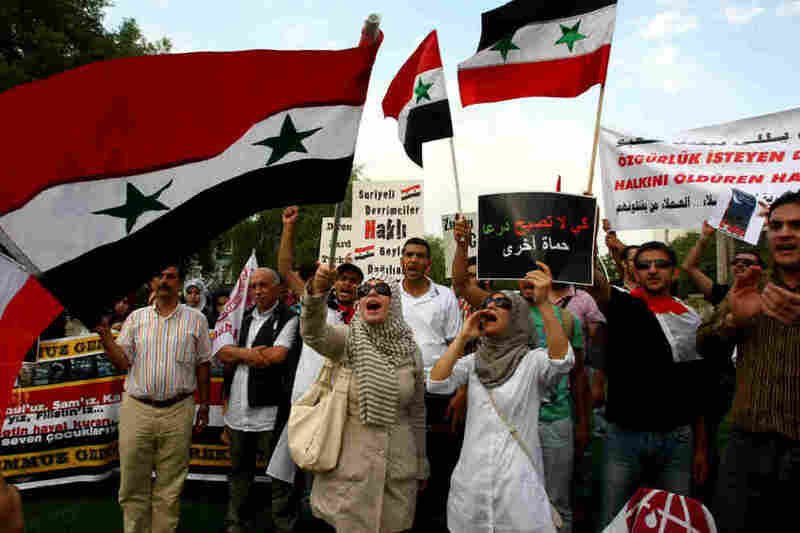 A pro-Islamic human rights group chants slogans as they call for the removal of Syrian president Bashar al Assad and his regime during a demonstration outside the Syrian Embassy in Ankara. U.N. Secretary-General Ban Ki-Moon condemned Syria's use of violence against anti-government protesters, urging Damascus to halt its military attacks on those unhappy with the regime of President Bashar al-Assad. In a statement, Ban said that Syrian officials "are accountable under international human rights law for all acts of violence perpetrated by them against the civilian population." As reported earlier today, Syrian forces attacked protesters Sunday and Monday, leaving as many as 142 people dead. In Washington, President Obama met with U.S. Ambassador to Syria Robert Ford Monday. Afterwards, Obama issued a statement in which he "reiterated his strong condemnation of the Syrian regime's outrageous use of violence against its own people," according to the White House, "and reaffirmed America's support for the courageous Syrian people, and their demands for universal rights and a democratic transition. " The Syrian government's acts brought a somewhat harsher response in Europe, where the shelling of Hama is being called a "massacre" by E.U. foreign policy chief Catherine Ashton. Monday, the European Union extended its sanctions to more individuals that it holds responsible for the violence, and urged the U.N. Security Council to take a strong stand, as well. Asset freezes and travel bans will be extended to five more people on a list that already includes President Bashar al-Assad and 29 others for their roles in a bloody crackdown on dissidents that began in mid-March. E.U. spokesman Michael Mann declined suggestions the E.U. measures apparently aren't having the desired effect of deterring repression. "We continue to apply political and economic pressure to the regime in Damascus," Mann said.